your SMS communications from a single place. Sending out an SMS text message is only half the story. When you use two-way SMS messaging you can receive replies to messages, and then act on those replies. To use two-way SMS messaging on the 123-txt platform you’ll need to use either a virtual mobile number (VMN), a keyword on one of our shared shortcodes, or your own custom shortcode with unlimited keywords. Sending a message from one of your virtual mobile numbers will allow the recipient to reply directly and immediately to your messages. Using a VMN also allows you to set up an unlimited number of keywords that can be used to sort messages inbound to the 123-txt system. Keywords can be used to forward messages to specific departments, reply with an automated SMS or simply tag it in your inbox for follow up. The 123-txt platform has a range of interfaces to make sending and receiving SMS messages as easy and intuitive as possible. That’s why we’ve utilised familiar interfaces such as a ‘mobile chat’ view. 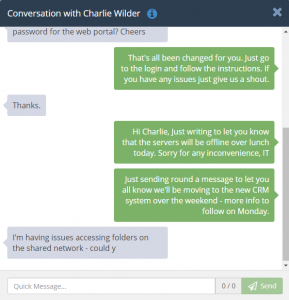 The chat view allows you to have a seamless 1-to-1 conversation, as well as look back through past conversations for reference with a single scroll. 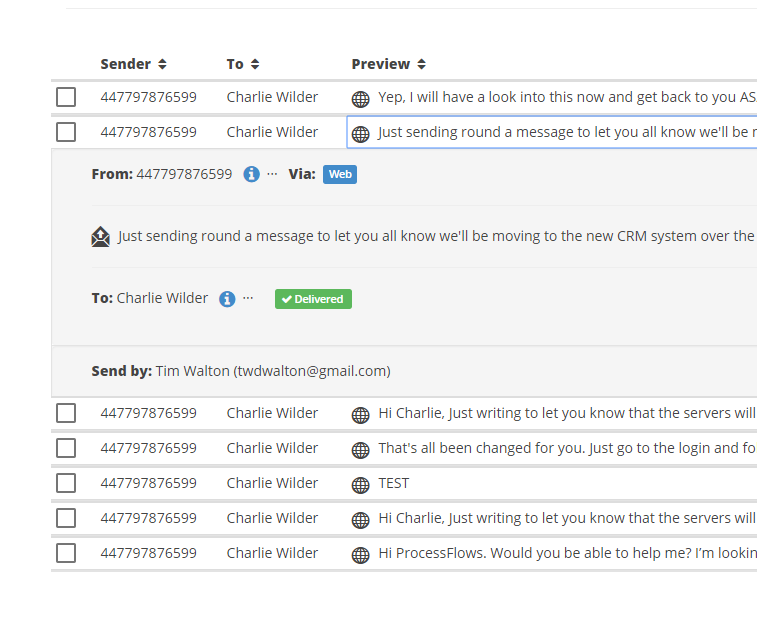 123-txt has a fully featured ’email style’ inbox for all of your inbound and outbound SMS. You can sort messages, search your entire database by name, number, message contents and date, as well as reply and forward directly from the message. Short numbers are 5-digit numbers, such as “60555”. Short numbers can be used in marketing materials, online ads and anywhere else your customers, staff or members might see them. These numbers are quick and easy for people to use and remember making them perfect for when people only have a few seconds to see or hear your advert. You can use short numbers to encourage any kind of inbound action or request. 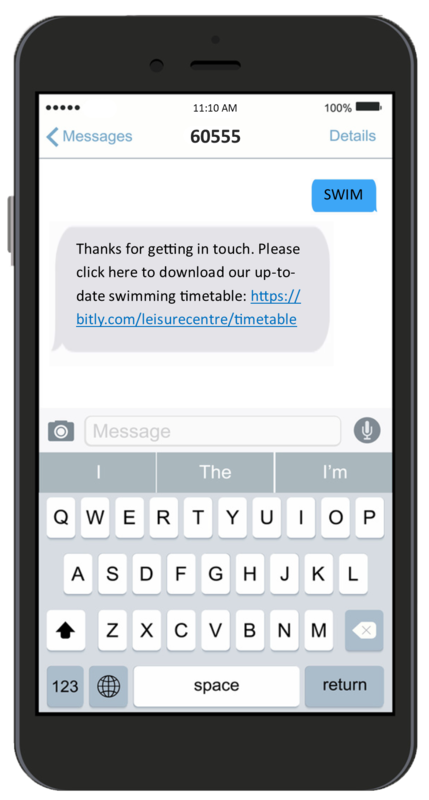 For example: “text SWIM to 60555 to receive our latest timetable” or “text STATUS to 60555 to get an up-to-date service status for your area”. You can set auto-responses to these inbound messages and send more information, such as attachments and links. Automatically forward incoming messages to a specific mobile number, email address or via HTTP. For heavy users of SMS, you can benefit from unlimited keywords by having you own dedicated shortcode. Automatically reply to inbound messages to let your customers know it’s been received, or send them further details and attachments. Allow senders to subscribe to specific lists to receive information, notifications, alerts etc. by automatically adding them to relevant contact groups using keywords. Automatically unsubscribe customers from specific/all lists based on keywords they text to your number (e.g. STOP). The 123-txt system has been designed to be easy and intuitive to use. 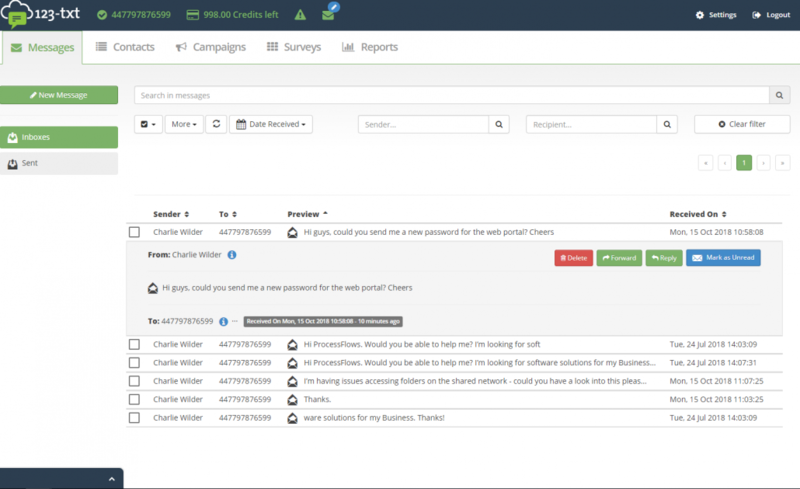 Familiar ‘sms chat’ and ’email style’ interfaces makes managing all your inbound and outbound SMS traffic effortless.